Here you will find a selection of examples to introduce some key features of DreamCalc. Most examples in this User Guide are given using the prefix algebraic input order, and you should compensate as required to suit the input order of your choice. The financial sections are an exception, and generally give examples using Reverse Polish Notation (RPN). For information concerning any specific function, refer to the Function Index page. Example: Determine the result of sin(-35) using degrees. First ensure the calculator is in the degrees mode by clicking Modes→Angle Mode→Degrees from the main menu. When your press [ENTER] you will see the calculation added automatically to the Paper Roll. Simply press F11 to toggle the Paper Roll at any time. Note. In prefix algebraic input mode, the [+/(-)] key acts as a minus sign input, rather than a sign toggle. Press it where you would use (-) on your hand-held calculator. This example applies only if DreamCalc is set to use RPN input order. Example: Determine (3 + 5) × (2 + 4). If you wish to learn more about RPN, refer to Calculator Input Style. Simply press CTRL-C to copy the current screen value into the clipboard at any time. Use CTRL-F to copy the the entire input expression. You can press CTRL-V to paste a value or input expression into the calculator. Select and copy the following string into your clipboard with CTRL-C. If the contents of the clipboard cannot be interpreted, the display will show "Syntax Error". When the calculator in RPN input mode, pressing CTRL-F will copy the last 4 registers of the RPN stack into the clipboard. When CTRL-V is used to paste an algebraic expression string (i.e. "log 678"), DreamCalc will calculate the result and place it in the x register. To store a value in memory for use later, use [STO] and [RCL] with keys marked MEM, A-F and 0-9. 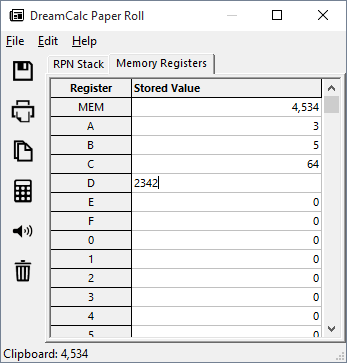 You can view and edit values held in memory directly from the "Memory Register" page tab of the Paper Roll & Register Window. A unit conversion can be performed by selecting the appropriate conversion from the Insert main menu. For example, to perform a temperature conversion, select Insert→Temperature and °F→°C. Example: What is 45.8 degrees Fahrenheit expressed as degrees Celsius? All conversions operate in a postfix manner, meaning that you input the conversion after the value, irrespective of what input mode you are using. Constant values may also be inserted using the Insert main menu. DreamCalc supports over 630 constants, and the range of constants listed under the menu can be configured from the "Miscellaneous" page of the Options Window. Many commonly used scientific constants are available from the numeric keypad. When you press the [a b/c] key, the result of the previous calculation will be shown as a natural (or common) fraction. The natural fraction form will also be shown if you input a decimal point. Example: Show Π as a fraction. The 'aprx' indication signifies that the fraction cannot be represented precisely, and it is thus an approximate conversion. You can modify the precision of fraction conversions by changing the 'Max Denominator' setting in the Options Window. The [a b/c] key may also be used to input values in common fraction form. Pressing it again will show the result of the reduction. Example: Reduce 1 + 8/6. *It was not was not strictly necessary to press [ENTER] here, but it demonstrates the conversion to decimal. The DMS [° ' ''] key behaves in much the same way as the [a b/c] natural fraction key—you can use it to both input values and display results in degrees, minutes and seconds. Example: Enter 5° 30' 15''. Example : Show 67.2376 in degrees, minutes, seconds. The [ENG] key provides a convenient way to view values in engineering form, without having to enable the dedicated engineering mode. Simply press [ENG] any time. Press [ENG] multiple times to decrement the exponent by 3, or use with [SHIFT] to increment by 3. Use the semi-colon key [;] to separate between real and imaginary components when entering complex values. When keying in a negative component value, use the [+/(-)] key, as demonstrated below. There is no need to enter parentheses around complex input as DreamCalc treats complex values as single entities (parentheses will automatically be shown around complex values in the Paper Roll Window). See Complex Number Calculations for more information. The [POLY] key allows you to solve polynomials. At this point, the solutions will be given in sequence: +5, -3, and -7, and pressing [ENTER] will page through them. Use the [STO] key at any time to store values you want to keep. For more information, refer to the section on Solving Polynomials. Reverse Polish Notation is commonly used by financial calculators; for this reason examples in the financial sections of this User Guide using RPN. DreamCalc, however, can perform financial calculations in any input order, and here we show the same calculation in both RPN and algebraic inputs. Example: What price should you pay on April 25th 2005 for a 6.75% U.S. Treasury bond that matures on June 1st 2015, if you want a yield of 8.25%. Assume that you normally express dates in the month-day-year format. For more information, refer to the Introduction to Financial Calculations section, or to Bond Calculations for specific information about the example.